Configuring a newly installed or purchased computer system usually involves installing software programs that are needed for work, entertainment or maintenance. Only a few users go the extra mile and create a custom setup CD that will install the needed software programs automatically. Most uses will search the web, download programs one by one and install them on the computer system. That's usually not a very pleasant thing to do as it takes lots of time to download and install all these programs. 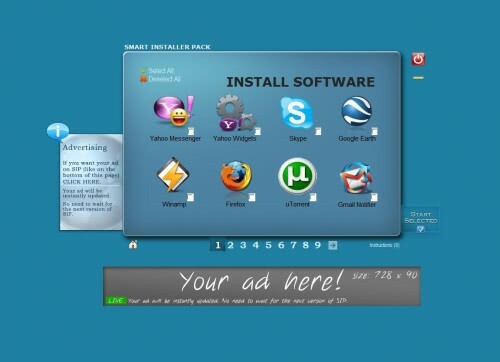 The Smart Installer Pack tries to reduce the time it takes to install popular software by providing an interface to download and install dozens of popular software programs. The program will display a full screen interface after installation that can be used to select some or all of the included software programs which will then be automatically downloaded and installed (one after the other). Included are programs like Firefox, Opera, Google Chrome, Filezilla FTP Server, Digsby, Skype, RocketDock, Picasa and iTunes among dozens of additional programs. The latest version of the selected software programs will be downloaded according to the developer's of Smart Installer Pack. One limitation that is currently in place is that the software programs are listed in groups of eight on individual pages and that it is only possible to download software from one page at a time meaning it is not possible to go through all pages to select all software that should be downloaded and installed. It is also a good idea to check the version of the programs downloaded with the latest version on the developer's website (or through an existing update function in the software) to make sure the latest version has indeed been installed. Smart Installer Pack would be more user friendly if all software programs would be listed on one page to streamline the process and make it more comfortable to the user. Other useful software of note are AVG Antivirus, AVAST Home Edition, OpenOffice, LogMeIn, and much more. Awesome tool…wondering if it will install the “Portable Apps” version(s) of some of these? Personally, because this part of a new install is tedious, I popped over to Radarsync and used the relatively new feature named PackZoola. The technicians are quite helpful and will install any program requested. My pack is Delightful Encounters which I am sure is somewhat outdated, but there are programs for that as well.